The company spilled hundreds of tonnes of coal into the sea at Santa Marta, on Colombia's Caribbean coast, when it tried to rescue a sinking barge. Drummond said it regretted what it described as "an industrial accident". The company had been ordered to pay a $3.5m (£2.1m) fine. The accident happened in January 2013. Drummond says on its website that one of its barges loaded with coal "took on water overnight due to high wind and wave conditions". 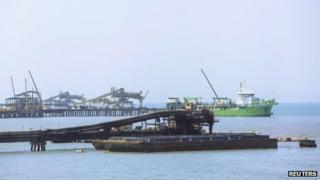 In the operation to rescue the barge, crane operators ended up dumping tonnes of coal into the sea. The six employees being charged include onsite supervisors and crane operators. Earlier this month, Colombia banned the use of cranes and barges in all its ports. The rules are aimed at preventing spillage and sea pollution. Environment Minister Luz Helena Sarmiento ordered the Alabama-based company to stop loading coal until it complies with new environmental rules. The company is building a new conveyor belt loading system that complies with the legislation. It is expected to be operational in March. In the meantime, the ban is expected to affect Colombia's coal exports. The South American nation is the world's fourth coal exporter, and Drummond accounts for 30% of that total.